Location: The Boone County Arboretum is located at 9190 Camp Ernst Road, Union KY 41091. Exit Southbound I-71/75 at Florence/Burlington Exit # 181. 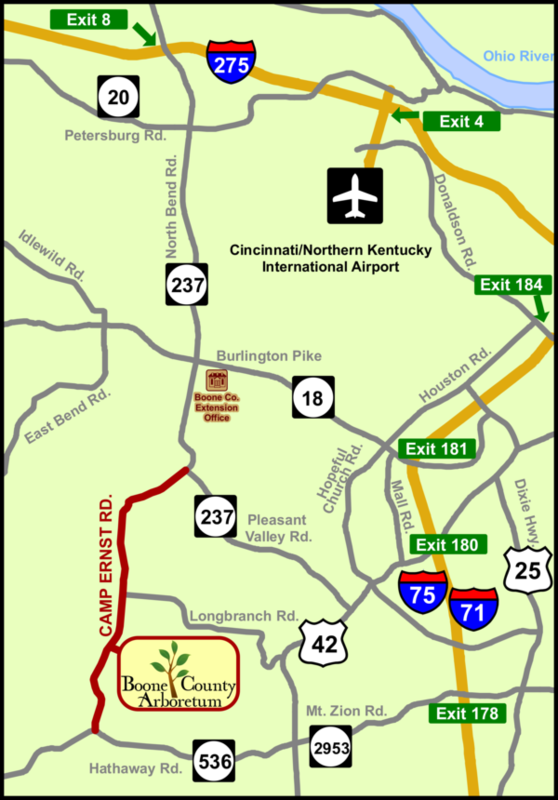 Turn right at end of ramp, and drive west on Burlington Pike (KY 18) for 3.2 miles. Exit right, then turn left to drive over 18 and continue south on Camp Ernst Road (KY 237) toward Union for 1.6 miles (DO NOT follow KY 237 onto Pleasant Valley Road). Continue south on Camp Ernst Road for another 3 miles to Arboretum entrance on left. Cross Burlington Pike (KY 18) and continue south on Camp Ernst Road (KY 237) for 1.6 miles (DO NOT follow KY 237 onto Pleasant Valley Road). Exit Northbound I-71/75 at Mount Zion Rd., Exit # 178. Turn left at end of ramp, and drive west on Mt. Zion Road for 2.8 miles. Cross "Old Union Road" and continue west on Hathaway Road for another 2.5 miles. Turn right onto Camp Ernst Road and drive 1.1 miles to Arboretum entrance on right.